Sports turf managers face the challenge of maintaining a safe and playable turfgrass surface while reducing inputs such as fertilizer and water – it’s no easy task. Surface firmness of athletic fields has received more attention in recent years due to increased awareness and heightened concussion prevention standards. With students returning to school, and resuming play on the fields, turf safety is critical to student-athlete health and safety. Head injuries frequently occur from athlete-to-athlete contact, but a 2009 study conducted by Pennsylvania State University’s College of Agricultural Sciences found that approximately 15% of concussions in football and soccer are caused by head-to-surface impact. Turf managers keep water conservation top of mind as drought events become more frequent and severe. Reducing water use is a clear first step to conservation, but if not done properly, too little soil moisture may result in hard playing conditions that are unsafe for athletes and also negatively impact turf performance. A properly maintained field will help reduce the risk of player injury. 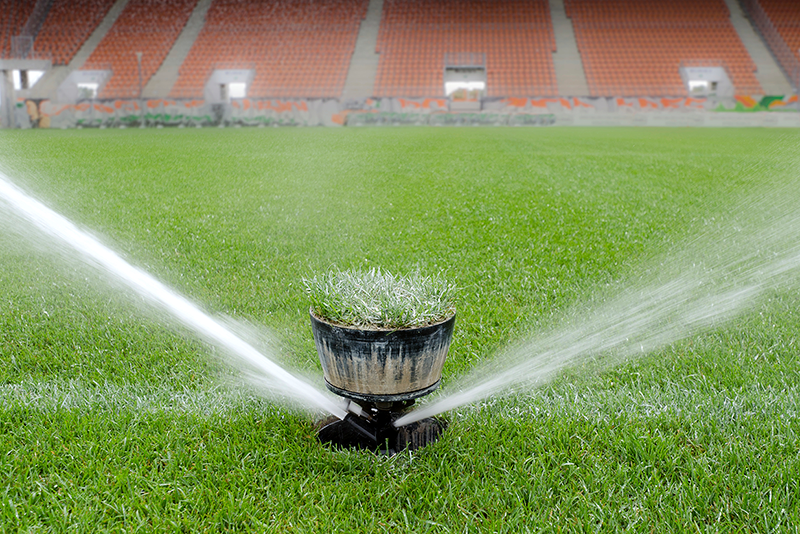 Optimizing water management is key for achieving a balance between conservation and a functional sports field. So, when is the most appropriate time of year to review surface hardness? To measure surface hardness, there is a standard rating system referred to as GMax. It recommends maximum limits for surface hardness of the respective playing surface, particularly with contact sports where a greater risk and emphasis of concussions is present. Although much of wetting-agent research has focused on golf course turf, Sports Turf Online mentioned recent findings supporting the application of surfactants to entire fields versus designated problematic areas. Wetting agents work by reducing the surface tension of water, allowing greater infiltration into the soil. Wetting agents may indirectly result in increased rooting depth and density, reduced disease appearance and enhanced moisture holding capacity. Under dry conditions, they help keep moisture in the root zone, which improves cushioning of the turf and player safety. In short, applying wetting agents across the entire playing field will 1) decrease the amount of water used and 2) may prevent unnecessary injuries caused by the athlete surface contact. On the other side of the equation, softer playing conditions bring up several issues as well, including increased turf damage and reduced surface balance, which can result in injuries. Implementing the use of wetting agents across an entire field will provide a firmer playing surface following a significant rainfall and help promote uniform wetting of turf surfaces. Employing the latest wetting agent technologies is becoming a key part of the game plan to maintain quality and safe turf. Before deciding on a wetting agent, seek the input of a trained professional to help select the correct surfactant for your playing surface. Be sure to apply a wetting agent early to maximize benefit, and be sure to follow the program throughout the season. If you are not receiving the desired results from your wetting agent program, don’t be afraid to make changes.